The tube is hooked up to an air stone which is hooked up to the air pump. The blue valve is where the outlet tube comes out of and into the lid. They were then covered with a 1/2 inch of manure. let me be the first to say, sweet! For those taking notes, the variety is PR from the FSR. The 1st flush yeilded a measly 50g. But, most of the fruits were up to 8'' long. Also, IMHO, and those who have tried puertos please let me know if you have experienced this also, I found that the taste of the fruits was "milder" or "sweeter" than other varieties. Edited by BrownPastures on 09/04/01 06:38 AM. again sorry for sounding like an idiot here...but you have two tubes right? one going from the pump to the air stone..and one going from the blue valve which is sealed air tight against the lid of the jar, and that tube runs into the growing chamber? is that correct? and did you lay the crumbled cakes directly on to the plastic? but you have two tubes right? one going from the pump to the air stone..and one going from the blue valve which is sealed air tight against the lid of the jar, and that tube runs into the growing chamber? and did you lay the crumbled cakes directly on to the plastic? Nice post and like the man said "you cant argue with success". One question: are the PR's a small strain? I couldnt help but get the idea that they were maybe "confined" in the small container you used? I dont know, maybe their confined. But they seem to grow nicely anyway. I don't think it decreased the yeald of the 1st flush if that's what your getting at. Hey thanks McMan ; ). To tell you the truth,that round dome, made you one of the people that popped into my mind when i stumbled on this. Kudos. #9 ... Yes straight manure , wet and squeeze. If it's at the right moisture consistency it should just crumble. I lay down a 1/2 inch layer on top. By the way, don't know if this could actualy be called a casing. If i remember correctly casing materials are supposed to be non-nutritious. So maybe it's like a fortified casing or something. lol.. any hoo , have fun it's easy to build and watch !! Nahhhh I just wanna know if YOU think those PR's mighta grown alittle fatter if given more room OR they dont need a helluva lotta room cause they're a thin shroom to begin with? Edited by Billyblastoff on 09/04/01 07:22 PM. No , i don't think they would have grown any fatter. The air exchange, IMHO was minimal at best so that might be why they looked like that (plus they were all curiously leaning towards the air outlet tube ;) ). But you have to remember that i was using a reeeealy small air pump(i think it's the smallest availible). Also, the substrate was pretty thin, 1.5 inches. Most of the fruits were 6-8'' long so i wasn't too dissapointed. I look at it like this, you've seen MM's post on his puertos right? Well, considering the size of the terrarium and the ammount of substrate i think the growth is normal if not great. If your talking about shape. Well, i guess i'm going to have to go back to MM's post. Seems the shape is identical : long , thin stems. I've heard of some people growing out short stubby PR's but i haven't experienced this yet. Edited by BrownPastures on 09/04/01 07:41 PM. I asked cause thats how my shrooms come out and Im trying to get away from that and grow em alittle thicker. how much direct sunlight or floresent lighting did you expose them to every day? The whole thing was in a cubbard. Not much light to speak of. Other than the daily "peek" i took. I guess it was just regular 'ol room light or the sun during the day. ; ). 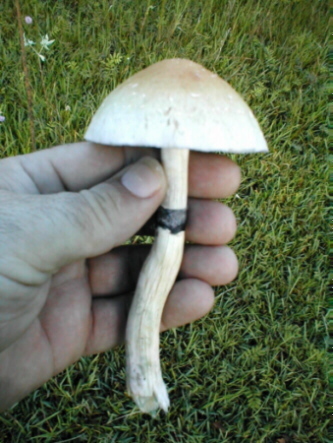 Here's the 2nd flush from this little bugger. Edited by BrownPastures on 09/08/01 01:45 PM. Looks good eough to eat! 2,130 topic views. 41 members, 143 guests and 25 web crawlers are browsing this forum. Generated in 0.037 seconds spending 0.01 seconds on 21 queries.